Mercedes Wiff is a specialist in community development who has worked on FAO forestry projects in El Salvador and Honduras. It was during the meeting of the Women's Committee for Communal Development that the Chairwoman, Dona Maria, announced to the other farm women that if the COHDEFOR technicians did not keep their promises to provide work incentives, she herself would undertake to pay them for the days they worked. COHDEFOR is the Honduras Forestry Development Corporation, whose promoter had recently presented the farmers with a new system to be used in working the very eroded and, in some cases, bare highlands of the settlement. The help he had offered consisted mainly of cereals for food, and farm implements for the construction of terraces and the reforestation of some areas. The men of the settlement had not shown any interest, since they were busy working the valley lands and were distrustful of anything new. Despite this, they agreed to give a plot of land to each woman to try. María and nine of the other farm women knew that these very steep lands would be hard to till in the manner they were used to. They also knew that every day firewood was becoming scarcer and more expensive. But they decided to try, first on Doña María's land and later on that of the others. This, then, was the reason for her insisting on paying them herself if the technicians did not do so: she was perfectly aware of the greater possibilities of this new way of working. It was, besides, a challenge to show that women could accomplish something different from their household duties. Settlers practicing traditional farming had no option but to destroy the forest to meet one of their basic needs: feeding themselves. 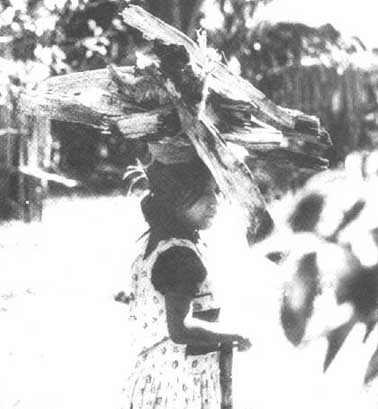 COHDEFOR's interest in the construction of terraces and in reforestation sprang from the extensive damage caused by Hurricane Fifi, which hit the northern coast of Honduras in 1974. This disaster gave rise to a study of the threat represented by irrational land use, destruction of the woodlands, and accelerated soil erosion caused by shifting cultivation. In 1976, with aid from UNDP and FAO, the Corporation drew up a project to plan and execute the improvement of the watersheds affected by Hurricane Fifi in the Sierra de Omoa, a mountain chain in the northeast of the country, covering an area of 720 km². In 1978, the project was extended to an area in the Lake Yojoa basin, the largest in the country, and in 1980 to a new region, Macuelizo-Pinalejo. The three project areas have similar social and topographical features: high population density, with 100 inhabitants per km²; the highest population growth rate in the country, 4.8 percent (1961-74); and an average of 5.6 inhabitants per dwelling, with 85 percent of dwellings using firewood or coal for fuel. There is no distinct land tenancy system, since the mountainous areas usually belong to the state or the municipalities. Nevertheless, there are some rural settlements which, having no legal title to ownership, are in possession of a document that validates their right to occupy the land. These are lands suitable for forestry, with steep slopes - in places, having gradients of even more than 60 percent - on which the farmers grow migratory crops: they fell and burn the forest to farm the slopes (growing maize and beans), and after two or three years are compelled to seek another area, each time higher up, because the soil is "worn out". Again they endeavour to fell the trees, to burn them and to cultivate the land. This uncontrolled system of burning down and cropping impoverished both the soil and the farmers themselves and is the reason why COHDEFOR has promoted the construction of terraces aimed at protecting the forest resource and at teaching farmers a new system for conserving their natural heritage. COHDEFOR saw that settlers practicing traditional farming had no option but to destroy the forest to meet, in part, one of their basic needs: feeding themselves. Nevertheless, the farmers recognized that the forest was moving farther away from them every day, and with it the possibilities of obtaining firewood and timber. Beginnings. The first activities implemented by the project were in the Sierra de Omoa, in the upper part of the industrial town of San Pedro Sula. Two hundred rural families living in the valleys were rehoused and three groups of day-workers composed of the same rehoused farmers were formed. These groups worked maintaining roads, constructing terraces and reforesting the valley lands where the potable water intake structures for San Pedro Sula are sited. During this period, the project identified the need for these lands to be cultivated by their owners rather than by hired day-workers, since this would lead to improved conditions of maintenance and use. The men looked at the women's work with suspicion - above all, at the terraces, whose purpose and use they questioned. The interest of the project was directed toward promoting the participation of farmers who could work their own land, either in groups or singly. The effort to promote participation made no distinction between men and women; it only invited farmers to take part in activities for soil conservation, for terrace farming with the application of adequate techniques, for reforestation and for forestry protection. The first response to the social promoter's intensive action came from the Women's Committee, made up of women living in Choloma, one of the villages most seriously damaged by the hurricane, in the "11 April" settlement. These 10 women started the construction of bench terraces for vegetable-growing. The same group had previously cultivated small plots of land in traditional ways. This had not earned them large profits but just enough to keep them at the same tasks every day. They knew very little or almost nothing about productive work. Their husbands were the ones who tilled the land on a larger scale, harvesting and marketing the produce grown in the valley. At the beginning, the work of the women's group was very irregular, since they could only avail themselves of the times when they were free from housework. As they did not all perform the same activities, not all of them had the same amount of time at their disposal. On many occasions this gave rise to problems in work relations, since some women worked for longer periods than others. On the other hand, the male farmers looked at the women's farm-work with suspicion - above all, at the terraces, whose purpose and use they questioned. They believed that the women would tire quickly and give up. However, they were wrong. The project, with the assistance of the social promoter and the field technicians, motivated the women to organize their work-time better, both in the home and in soil-conservation activities; and later in growing, harvesting and marketing. For example, work schedules were laid down and observed. The women were taught to understand more fully the adequate use of implements for the construction of the terraces, and they were trained to use better techniques for sowing vegetables and planting orchards. The effective participation of the women in these activities gave them self-confidence; this, in turn, influenced the decisions of the others. Their effort was rewarded by the fact that 14 other women and 10 men from the same settlement joined them. Some months later, three groups of men and women from the same settlement could see for themselves the immediate benefits stemming from working with the new system. 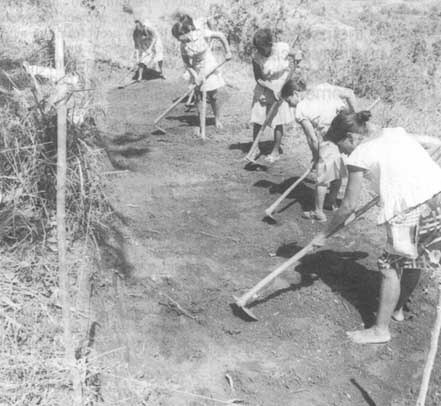 Jointly, the three groups dedicated themselves to the reforestation of the settlement's highlands, which were not suitable for the construction of terraces but were adequate for planting forest trees. Forty hectares were reforested with timber trees. The villagers built two irrigation dams and established a nursery for fruit trees, not only for their own use in planting in their soil conservation efforts but also for use by the other groups who were starting on the same project. 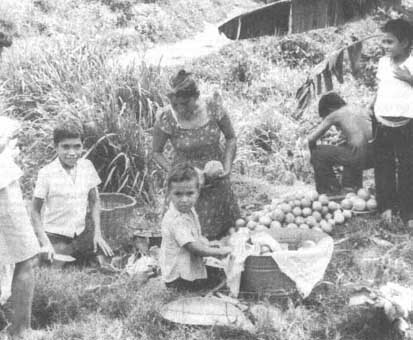 The success of the initial effort made by Doña María and her group was reflected in the acceptance of the new techniques by farmers in other areas. After four years of work, 78 villages had participated, with the involvement of 1834 farmers of whom 590 were women. The women who usually participated were between 30 and 45, an age when they had already produced their "quota" of children. Women themselves were, on many occasions, the hardest obstacles to be overcome. It may be said that, initially, the factor that led to the participation of so many women in this project (32 percent) was the men's rejection of the new activities until their satisfactory performance had been proved. The project promoter knew how to profit from the situation and transform the interest of the Women's Committee members into active participation. Although this was not explicitly planned, the project opened up the possibility for it, encouraging and supporting the initiatives needed through all the stages during the four years' activities. However, it was not as simple as might be believed. There were problems both at farmer level and at field-personnel level. The field personnel, in addition to their lack of field experience, had no confidence in the participation of women, and only the experience of working together managed to change their attitude to an appreciation of the efficiency of women's work. · Tradition has maintained, especially in the rural areas, that the role of the woman is exclusively to be a mother - to give birth and to raise and feed her children. In addition, she must busy herself with preparing meals for the family, draw water, collect firewood, look after the elderly, keep a small area of crops around the house and raise some farmyard animals. In these tasks she is helped by her daughters who, when still young, look after their even younger brothers and sisters and especially carry water and firewood. In these circumstances, women themselves were, on many occasions, some of the hardest obstacles to be overcome, considering that the housework seemed to them more than sufficient without adding further work, such as going up to work on the uplands. · The women who usually participated were between 30 and 45 years of age, an age at which they had already produced their "quota" of children and the mother role had ceased to have the importance of earlier years. They were women whose children were old enough to help with the housework; they had a certain degree of independence; and many were leaders or participants in community groups. Thus, they could decide to participate themselves and support the participation of their companions in activities that were different from those prescribed by their role as women, without receiving negative and ostracizing criticism from their communities. · In the farming family, it is the man who works and brings in the money to keep the household. The fact that his wife works is considered a disgrace to him and makes him appear incapable of providing for his home. This was the situation of many women who, although wanting to participate, did not obtain their husbands' permission to do so. Only a small percentage of the men accepted that their wives should work and considered it a means for their personal fulfillment. · The training and service problems generally stem from this last problem. The farm woman, for example, leaves school at an early age to help with the housework or to be married. The little education she has received is forgotten through disuse. Besides, she has no time to attend night-school, not only through lack of interest but also because of the arrival of children; her duty as mother and wife is more important. · Men and women with adequate education and training could cooperate effectively in the progress of their families and communities. However, training is received mainly by men. The same training and educational opportunities must be offered to women to facilitate the performance of productive work. · It is a fact that despite all the legal provisions and guarantees of the Agrarian Reform, few women fully benefit from it. · If a woman tries to work on a farmstead, she lacks the credit needed to develop it because she does not have a title or land-ownership deed to back her. This problem also arises with men; however, it is less frequent. 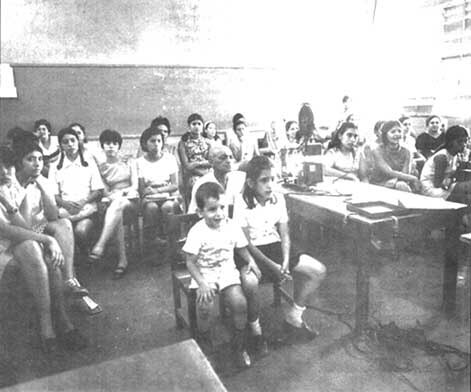 NICARAGUAN WOMEN WATCHING FORESTRY FILM could what worked in Honduras work here? On some occasions, several women have joined together to obtain a plot of land on loan from the community or settlement, often with the risk of having it taken from them when conservation and planting works have been initiated. · Programmes must be drawn up that foresee women's participation and in which men and women enjoy the same opportunities. The proportion of women participants will need to be established. · Personnel, promoters and field technicians must be trained to organize activities for an adequate programme involving the effective participation of both men and women. · The legal or interpretative obstacles regarding land tenancy must be examined and a way found to correct them so as to obtain greater participation on the part of women in productive activities. · Effective training systems must be made available to women, keeping in mind the other activities they must perform daily, and offering the right training for the change in activities they will have to undertake, involving simple programmes which will progressively improve their education. Thus, they will be able to apply the new techniques in a more knowledgeable way. · The programmes must be based on appropriate technology with easily applicable practices and methods. The adoption of implements normally employed and easy to use (hoes, spades, rakes, machetes), which the women can also buy with their own earnings or through specific programmes, is recommended. · If women are allowed to benefit from education and training, the justification for their existence will not be motherhood alone - often viewed as a kind of "pension" (more children, more hands for the work, higher income); they will also play a more productive social and economic role. Planting trees could be one of the best ways to ensure one's pension; indeed, in the words of one participant: "I'll work while I can, so as to be able to benefit from my trees afterwards." The suggestions made here will not be able to bear fruit unless there is a real interest in changing, and unless men are associated with all the activities that involve women. On mutual understanding and accord may depend the transformations necessary for truly effective participation. The changes can be implemented gradually, in pace with the rhythm of each community, taking the local customs into consideration. The methods of promotion and the participation of the family and communities are other very important factors. Above all, account must be taken of the fact that if women are unaware of their own ability to cooperate in development, their participation may be very limited or not amount to anything at all; and if their participation is not considered, we shall be losing half our human resources.